Most of our readers already know that we have been cooking up a bun, but we thought we'd make the blog announcement after getting our "big" ultrasound. We could have found out the gender, but, (while some say we are crazy and/or masochistic), we decided that we prefer a good ol' fashioned surprise on delivery day. Hence we refer to our growing baby as "Judelliott." The nickname is actually a combo of the names we have picked: Jude, for a boy, and Elliott, for a girl. According to the ultrasound everything looks good so far...always a relief to hear, especially after months of morning sickness and praying for the best! We've started the habit of taking belly pics. Melissa is around 12 weeks here. We know there is not much to see, but we just had to start somewhere with the record. And here is around four weeks later. Still not much, but there is a bump, and actually it's grown since then, (a little). We'll keep with the four week intervals and take another portrait around week 20. Melissa feels like she is huge compared to her pre-pregnancy figure, however she feels she cannot say anything because then she hears, "Oh my goodness, you're so tiny!" (more than once, we might add), and feels a little stupid. Needless to say we are pretty excited! We're just glad all is going well so far and Melissa is able to hold down some food each day. 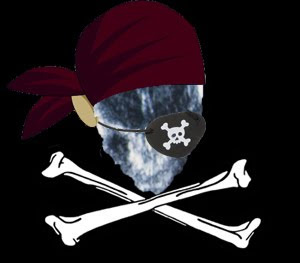 Before we go, and at the expense of being accused of child abuse even before we've given birth, we just had to make the comparison between the ultrasound picture they gave us and a Jolly Roger. It is not Judelliott's fault that the tech gave us the big-head view, but that's how it went, and we just see it for what it is! Until next time just remember: To error is to be human. To arrrrrr is to be pirate. Shiver me timbers! Glad you finally made it official. And the fact that you are not puking up everything that makes its way into your stomach is an added bonus! Congrats again on your little "it"! how fun! i so want to know the gender... i don't know how you can stand it! Yay!!! Eric and Shantell's first baby is due on Feb 28th. They'll be twin 2nd cousins! I love the fact that you want to be surprised. I didn't know what any of mine were either. I hope Melissa is over all that yucky morning sickness by now. Congrats! Haha YES! You guys are gonna have a terminator baby too! Don't worry they turn out really cute- Congrats!